As tributes are laid outside the factory, there are those who are keen to conceal their guilt. Carla, Nick and Gary are all aware they could be looking at a manslaughter charge if it’s proved they knew how dangerous the roof was. Meanwhile a man enters the cafe and reveals he’s Wayne Hayes, the boy Roy and Hayley fostered years ago. As Carla arrives at the police station for questioning she’s shocked to discover that Wayne is the health and safety inspector. Gary is also called to make a statement. Unable to face everyone Carla decides to get away for a few days. In the aftermath of the factory collapse one family face the devastation, grief and anger that comes with losing a loved one. As one family prepare for a funeral there are those eager to point the finger of blame following the factory collapse. Michelle tells Ali how proud she is of the way he saved lives during the factory collapse. Buoyed by her words Ali decides to go back to work as a doctor. Meanwhile Ali and Ryan are shocked to discover someone creeping around the bistro. Explaining that he’s the health and safety inspector overseeing the factory disaster, Wayne assures Roy the boat fire wasn’t the cause of the roof collapse. When Roy reveals he looking into the history of a ring he inherited from his mother, Wayne offers to help with his research. Sarah makes it clear to Gary that if he keeps quiet about what he knew about the factory roof they’re finished. Robert reappears at the bistro and is evasive about where he’s been for the last few days. Having heard the details of the factory collapse he decides to stick around. Michelle orders Ryan to keep an eye on him. What is Robert’s game? After some research into Sylvia’s ring, Wayne reckons it originates from Egypt. Brian suggests it may have been brought back by a serviceman stationed out there. Meanwhile Gary’s unnerved to find the gate to the builder’s yard unlocked. Daniel’s happy to finally bring Sinead and baby Bertie home from hospital. They’re touched to see Ken has decorated the flat with bunting and a welcome home banner. Jan and Anton call on Gary to offer him some work on a new housing build. As Gary celebrates in the Rovers Seb is gutted to discover it’s the same site where he has been offered work. As Gary and Sarah head home their good mood is broken when they find someone has vandalised Gary’s van and stolen his tools. Who is behind it? In Carla’s absence, Michelle assures everyone that Carla couldn’t have known about the state of the roof as she would never have put lives at risk. As people ruminate as to whether she orchestrated the factory collapse herself so she could claim on the insurance, Wayne continues his investigations. Finally a memorial party is planned in the wake of the factory disaster. 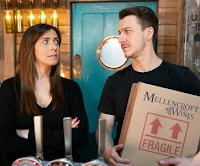 In the bistro, a preoccupied Robert is clearly under pressure and when he overhears Ryan on the phone to Michelle, and realises he’s spying on him, a furious Robert tells Ryan he’s sacked. Sarah’s convinced Seb is behind the vandalism and want to call the police but Gary refuses, what is he hiding? Meanwhile Seb insinuates that Gary and Jan are cowboy builders and most likely responsible for the factory collapse. As Wayne questions the factory staff it becomes clear this was not an accident caused by Sally and Gina being on the roof. Taking Carla’s disappearance as a sign of her guilt conscience certain people are on the warpath as grief, frustration and anger build. Meanwhile Sinead fusses over Bertie, Daniel assures her they’ll be great parents. Ryan tells Michelle her plan backfired and Robert has given him the sack. Robert tells Billy he’s now got a vacancy and will happily take on one of his young offenders straight away. Billy’s thrilled.